Our facilitators have expertise in Ebru. 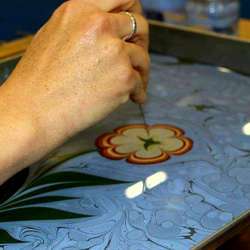 They will give us a short historical background about this Traditional Turkish Art and they will be teaching us the basic steps of how to create an Ebru on water. They 'll let us to create our own EBRU ARTS and we will keep them as souvenir at the end of the day. Ebru is the traditional art of creating colorful patterns by sprinkling and brushing color pigments on a pan of oily water and then transforming this pattern to a special paper. It has been a traditional art of book enriching calligraphy and binding books for many centuries. In the 13th century, the first forms of Ebru emerged in Central Asia and spread to Anatolia through. During the Ottoman period, Turkish calligraphers and artists created new forms and perfected techniques. ****Don’t miss the opportunity to take your place as we have a limited attendee capacity. Also, if your plans change and you cannot make it anymore, it is highly important that you immediately cancel your attendance and inform us about it.